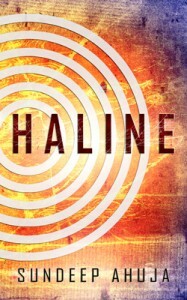 HALINE is at once an engaging narrative full of suspense and a compelling vision of a dystopian post-apocalyptic future crippled by climate change. Natasha Biron, leader of a group government dissenters, is struggling to survive in a world crippled by decades of war and famine, and is determined to ensure President Gavin Jemmer’s failure at re-election, which takes place in four days. Meanwhile, government employee Joaquin Deva discovers compromising classified information about President Jemmer that drives him to risk his picture-perfect life and embark on a dangerous journey to find the one person who can help him: Natasha Biron. Over the next four days, their paths collide—shattering their realities as they each discover the lies they’ve been told and the unthinkable truth they share. Sundeep Ahuja’s newest novel HALINE is a cautionary tale, warning readers of the dangers to our freedoms if our planet is not tended to properly. It is the answer to the troubling and timely question: What if we do nothing? I care about our planet. And its people. But I’ve been worried that we people haven’t been taking good enough care of our planet (or each other, for that matter). Two years ago I started writing a non-fiction “update” to An Inconvenient Truth in hopes of raising awareness around climate change and corporate greed (news flash: they are related). Then one day it hit me: I should write a fiction novel about climate change and corporate greed…it’d be much more fun to read! Like any great book, Haline is really about its main characters and their personal journeys: Natasha, who has something to prove; Aaren, who has something to hide; and Joaquin, who discovers something about himself that changes the course of his life – and all their lives. Natasha muted the screen in frustration. She was just over three days away from the Election, and she still had nothing. Natasha walked to the mirror in the makeshift ready-room and looked up, seeing the familiar face of disappointment. “Last chance, Natasha. If he wins by the margin he wants there’s no telling what he’ll do. Failure is not an option.” But even as she uttered the words she knew them to be false; as of right now, failure looked to be the inevitable option. Again. She stood for a moment, then grabbed her acid rain–proof olive-khaki jacket from the coat rack in the corner and walked down the tunnel toward the surface exit for some fresh air. Perhaps the twilight sky would have her answer. Emerging silently into the deserted park, Natasha quietly closed the gate behind her and moved to the fenced grove of willow trees. The air always smelled a bit better, a bit fuller, by those trees. She slowly closed her senses to the sounds of crickets and buzzing night insects and opened them to the quarter moon smiling down on her, almost mockingly. “What does it really matter? Everyone’s safer now. Let go and move on…” She said softly to the night sun, and to anyone who dared be out past Epsilon Ring curfew. But the silence of the evening echoed back, unconvinced by her tone, and the moon’s unwavering expression reflected what she feared, what she knew most deeply: of course it mattered. Now more than ever, perhaps. Loosening the snaps on her boots, she sank to the ground and leaned back against a rock. Natasha turned her eyes downward to the uncut blades of wild grass wafting back and forth in the soft wind, her legs outstretched and crossed at the feet, her arms folded across her chest. She inhaled slowly, closing her eyes to meditate. Now more than ever. Sundeep Ahuja is a social entrepreneur and former actor who has been writing for over 15 years. His work has appeared in major blogs and news outlets across the country. He lives in the Mission District of San Francisco and Haline is his debut novel.